I was inspired to start Joy of The Horse because of my deep infatuation, interest, and love of horses. I thought how very lucky I am to be able to own and care for two wonderful horses from whom I reap all kinds of benefits. I want to share that experience with people who have rarely or never had an opportunity to be near horses, or those who want to rekindle a long ago experience. 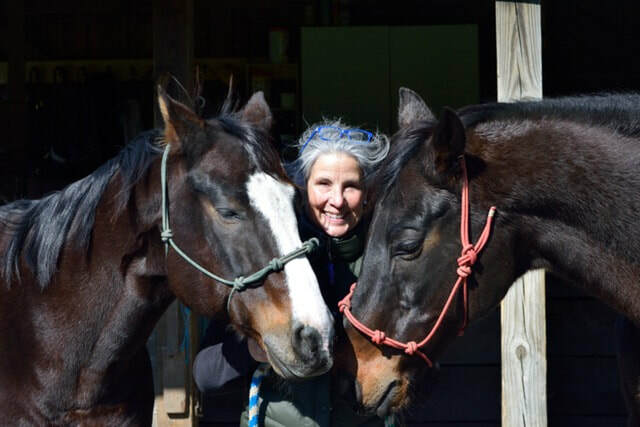 As a certified instructor I will help teach people to safely be around horses, to respect them, and to listen to them and learn how they communicate with us. My lessons are tailored to the individual and informal in style. While they are not riding lessons, they can be considered a preliminary introduction to riding. Students will gain general knowledge about horses and riding, and should they decide to pursue their interest in riding further, I will help put them in contact with the appropriate instructors. Joy of The Horse will give clients a basic education on horse care, horse knowledge, and most importantly give a feel of whether or not they like to be around horses. Students will learn how to safely approach, groom, bathe, tack, lead horses and more. Our lessons are perfect for anyone who thinks they want to start riding, but have had no experience with horses. Horses have the potential to enhance your life, so if you have always wanted to be around a horse or communicate with one, please contact me. Joy of The Horse is a great place to start your journey! Reach out today!